It seems like everyone forgets how to drive as soon as the first snowstorm hits. Icy roads, cold weather, and lots of holiday traffic can make driving during this time of year stressful. Before you pack up your car for your holiday travels, you may want to review some of these winter driving tips! Always keep your gas tank at least half way full. Not only does this keep you safe in case of emergencies it will help keep your gas line from freezing up in cold weather. Don’t use your cruise control when you’re driving on wet, icy, slick roads. When you keep up the same speed on slippery surfaces, it’s easier to hydroplane and get into an accident. Accelerate and decelerate slowly as you drive so you don’t lose traction, and if at all possible, don’t stop your car. It’s much harder to get started than it is to keep going - especially on hills. Keep a larger distance between you and the car in front of you than you would in nice weather. It takes longer to stop when the roads are snowy, so you’ll want to make sure you have enough space if you need to stop suddenly. You should have a coat, blanket, gloves, snacks, water, etc. in your car at all times just in case of an emergency. If something happens and you’re stranded on the side of the road, you’ll need to have things to keep you warm and full until help comes. If you've got kids and are going on a long trip in rough weather, headphones and a DVD player are a must! A quiet backseat will help minimize any tension that comes from driving in a snowstorm. If at all possible, just stay home! The best way you can stay safe is by avoiding driving in bad weather. If you do need to go out, make sure you use your seatbelt! 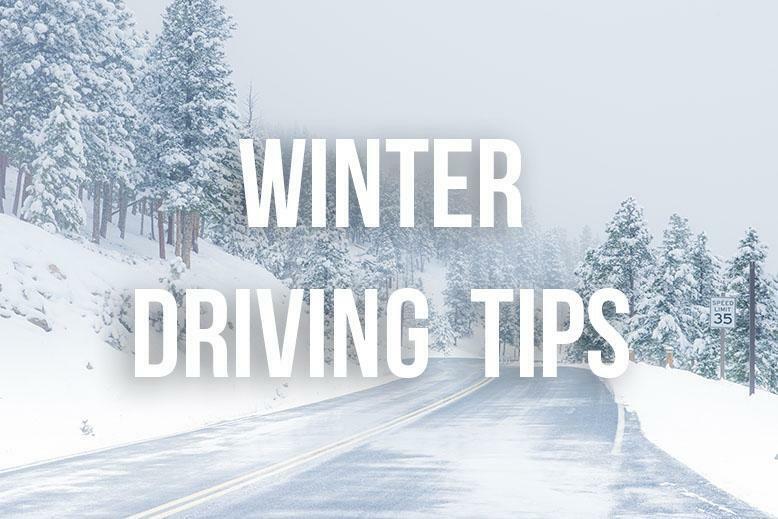 Check out this page for even more tips and share with us some of your winter driving tips!